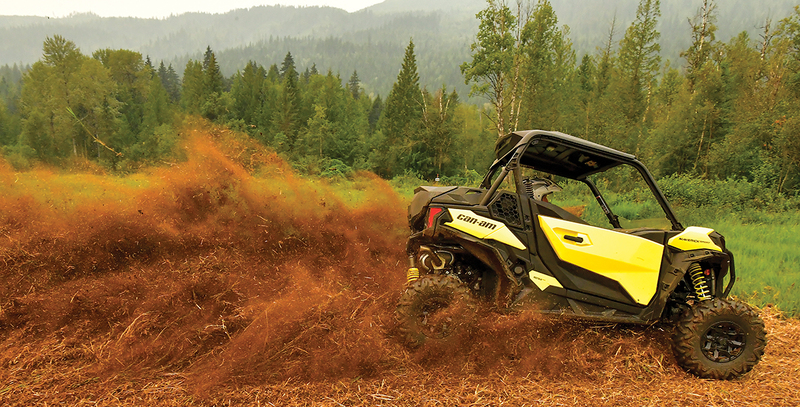 Can-Am’s X3 is taking over the high-performance UTV world in the 64-inch- and 72-inch-wide segments. For the tight-woods guys, they have a 50-inch Maverick called the Trail, and it’s giving the RZR a run for its money. For the midsize world, the Maverick Sport broke on the scene this year, and recently we had a chance to get behind the wheel of this exciting 60-inch wide woods machine. 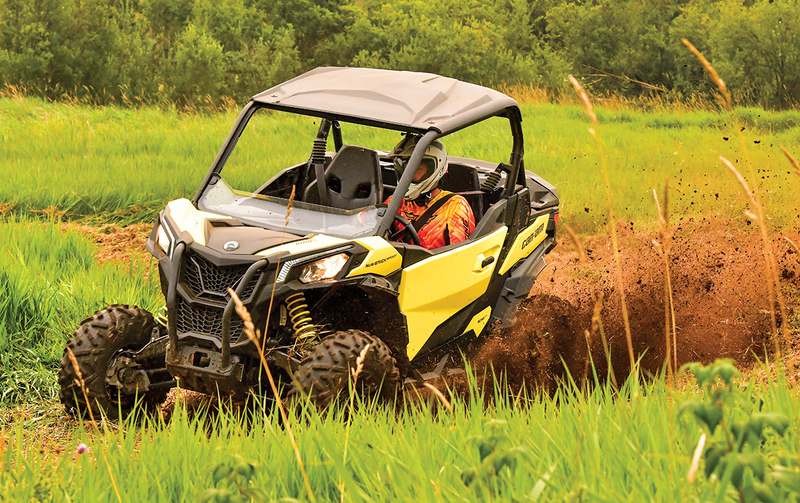 For trails that open up a bit, the Maverick Sport is a blast to drive wide open throttle. It has power to please anyone looking for a thrill. Top speed for both versions is right at 75 mph. The R model gets there about 5 seconds quicker. For this Maverick, Can-Am is using its latest Rotax V-twin powerplant. The compact mill has proven itself in its ATVs, the original Maverick and older Commander for years. Two versions are available for the Maverick Sport 1000 and 1000R. 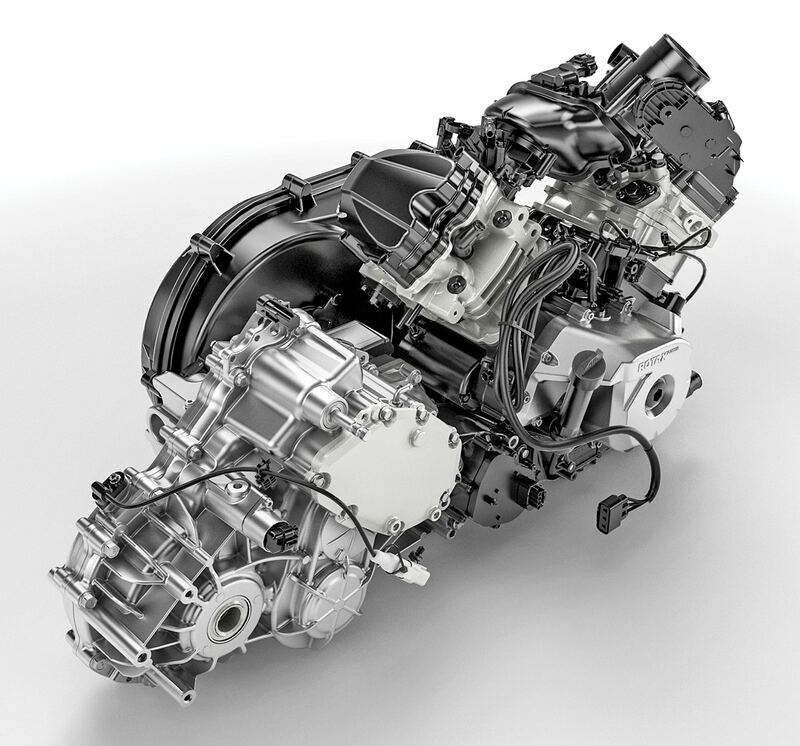 The standard 1000 offers 75 horsepower, while the R pumps out 25 more. A full-featured cockpit has lots of storage in front of the driver and passenger, a quality steering wheel and solid grab handle. If we could nitpick anything, we could use a bit more legroom, especially if you wanted to install thicker aftermarket seats. Not that the standard engine is tame, but the 1000R really packs a punch you not only can feel but can hear too. The R engine has a more aggressive tune and a much throatier exhaust. The seat-of-the-pants difference is almost like the feeling you get with a turbo. It’s that noticeable. The 1000R model, however, does come with a $1500-larger price tag. Here are the differences between the 1000R model and the standard 1000 Sport: the R gets a cool-sounding race exhaust, twin CVT intake tubes and a high-performance tune, allowing 25 additional horsepower. Great. Four disc brakes handle the stopping chores perfectly. When you get hard on the binders, the car slows down fast without any front-end dive or rear-end lift. The pedal is perfectly placed, and we never felt any fading. The frame and bodywork are the exact same size on this machine as they are on the 50-inch Trail. Only the doors, fenders and suspension arms are wider. The shocks are longer too. The doors for the Sport will fit on the Trail model. Double-A-arm-type suspension is found on all four corners. This setup is a bit stronger than the trailing-arm suspension you find on the X3. By “stronger,” we mean it will take abuse and mistakes better. There are no radius rods to bend if you do scrape a tree or land with a big side load off a rock or other obstacle. The 12 inches of travel are preload adjustable, and the suspension is plush at low speeds and very forgiving at high speeds. 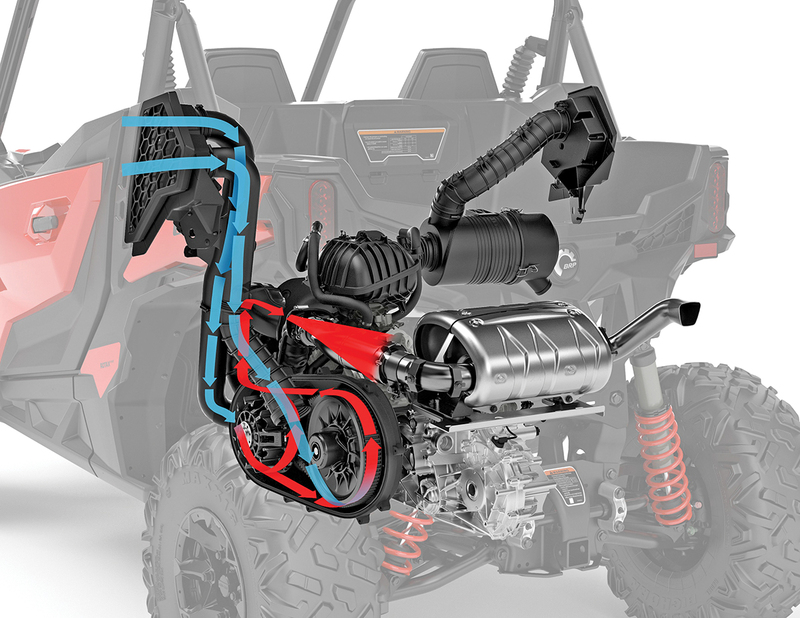 The longer wheelbase of the Maverick Sport (compared to a RZR’s) helps make the suspension work even better. 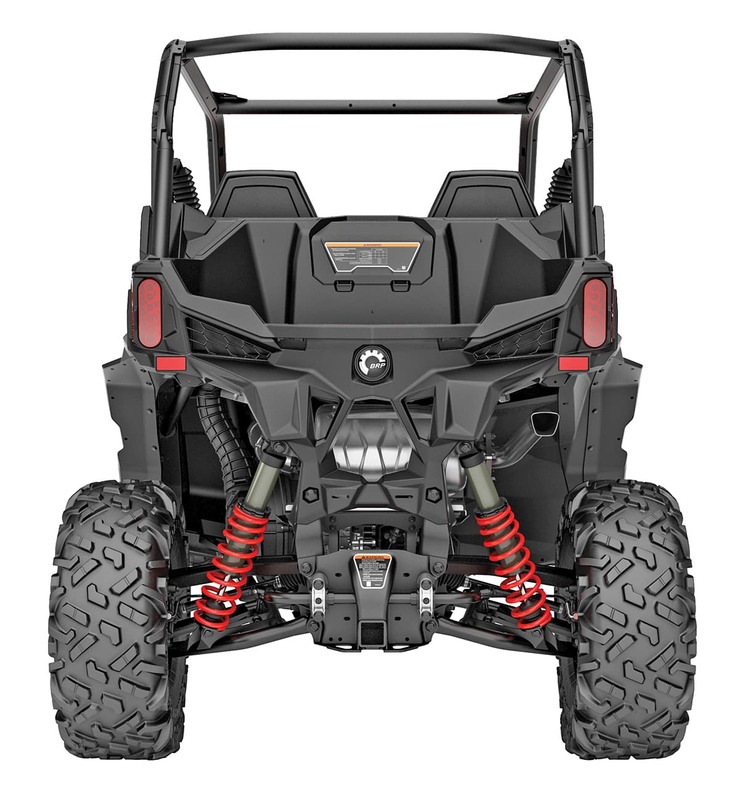 The rear suspension has a lower A-arm and an upper I-beam similar to a Polaris RZR S. The Maverick has 12 inches of travel and the RZR has 13. The Maverick’s 11-inch-longer wheelbase makes it feel like it has more travel without hurting its turning abilities. 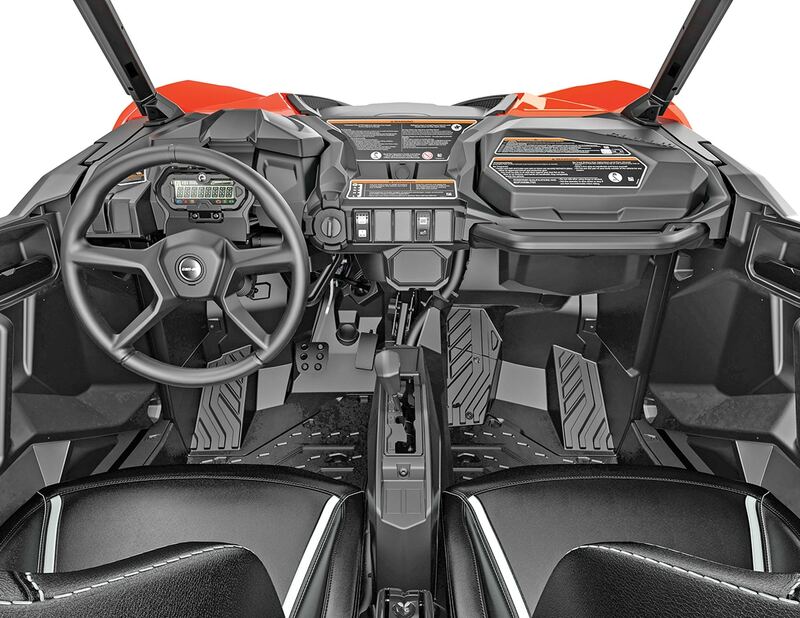 With a 90-inch wheelbase, the Maverick Sport is basically the same length as a RZR XP 1000; however, it feels much smaller and turns even better. 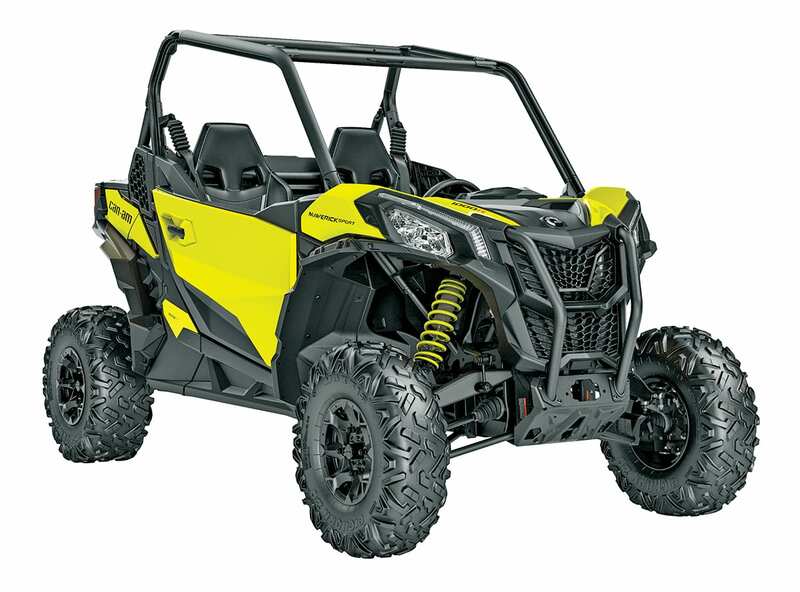 Two models of the Sport are equipped with Can-Am’s DPS. Although the steering is not adjustable into different modes as on the high-end Outlander and X3, it doesn’t need to be. Steering is light with virtually zero feedback. On high-speed trails, the car is stable and predictable. It doesn’t wander unexpectedly or float. You feel planted all the way up to the 70-plus-mph top speed. 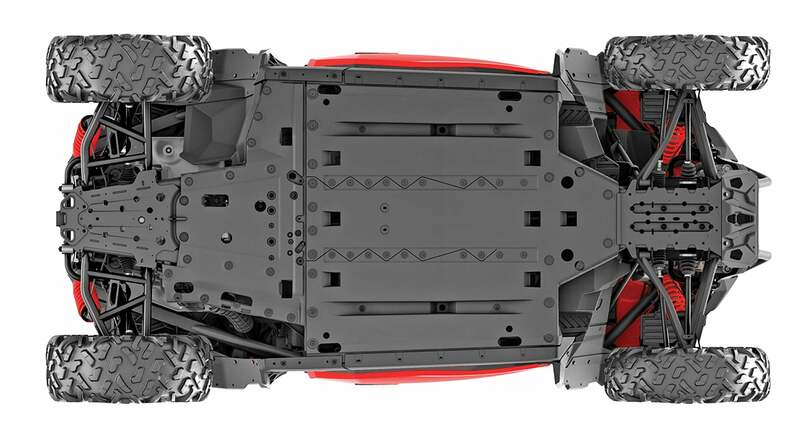 A full-coverage skid plate protects all the vitals underneath. We barely put it to the test. The ground clearance is surprisingly ample for even the gnarliest trails. In the tight stuff, again, the car is super predictable. Since you sit fairly low in the cockpit, you feel like you are driving on rails in and out of the trees or rocky sections. With the longer car, it takes a tiny bit more effort to think about and set up for a corner, but the length allows you to get on the gas earlier and exit the corner without fear of stepping out. It drives exactly where you point it. Body roll is minimal; however, you can still corner harder with two people in the car versus driving alone. BRP’s proven Rotax V-twin sits behind the driver’s seats. Two belt-saving measures are built into this model. If the computer senses slippage, a light will alert you to put the car in low range. Second, if stopped for long periods, the clutch sheaves will rock and rotate to keep the belt from spinning on the same section of a hot clutch. 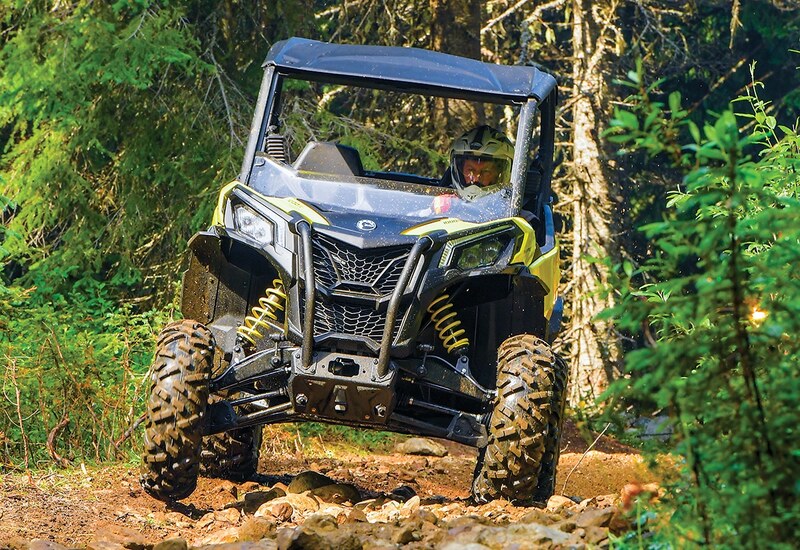 If you are looking for an exciting 60-inch-wide machine that can tackle tight trails well and fly down wide-open gravel roads at a fast pace, the Can-Am Maverick Sport is a great option. If you are riding primarily wide open, meandering trails, you can get away without the extra expense of the EPS. But, we suggest it for every other type of riding. The extra investment for the 1000R engine is worth the price and noticeable as you zip down the trails; however, if you’re not a speed demon, you won’t be disappointed at all with the lower-cost standard model, either. It’s the fastest, best-suspended, most comfortable 60-inch-wide machine we have ridden in stock trim. The tighter the trail, the better. 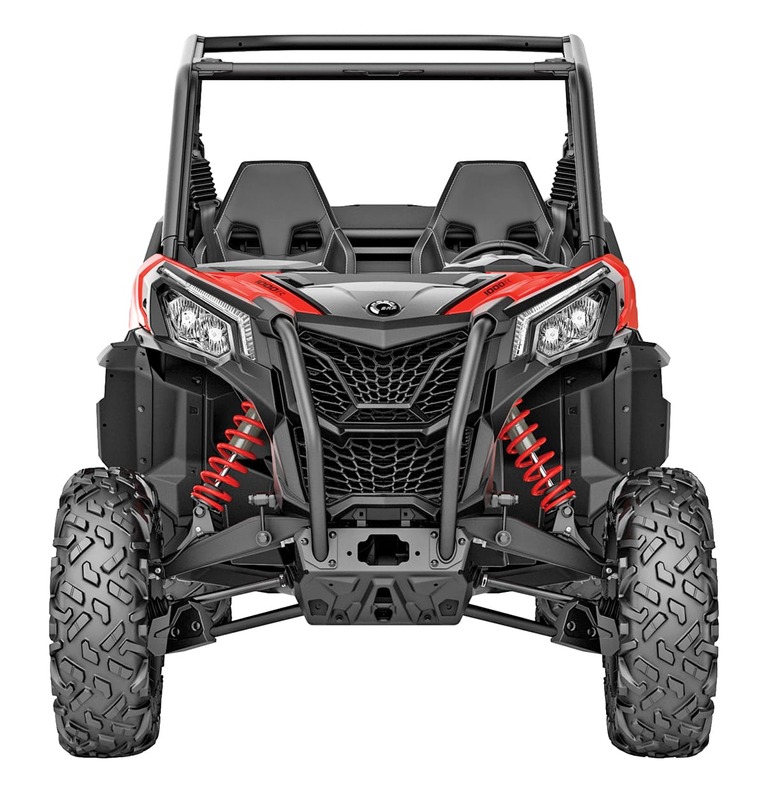 The Maverick Sport tackles 60-inch trails as well as any UTV out there. After our first test, the Sport is in the lead for our next UTV of the Year prize. The Maverick Sport has a starting price of $14,699 for the non-EPS model and comes in white only. For $16,499, you get EPS and red bodywork. The top-of-the-line 1000R sells for $17,999 and is available in red or yellow. Visit www.canamoffroad.com for more info. Bed weight limit 300 lb.